It’s early in the season but as you’ll see below, not as early as you might think. Here is the state of play so far with the win count for the 18 World Tour teams. Lotto-Belisol top the table with 10 wins. The team might look dependent on André Greipel but he has “only” four wins and the team has won with several other riders. Meanwhile rival Belgian squad OPQS can thank Mark Cavendish for six of their eight wins. Blanco are having a great start to the season with a range of riders winning sprints and uphill finishes alike. At the other end of the chart note Radioshack-Leopard have one win. This was the New Zealand national road race championships were they got a 1-2. Hayden Roulston’s win counts but it wasn’t in the same format as all the other wins. There are four teams without a win: Astana, Euskaltel-Euskadi, Garmin-Sharp and Vacansoleil-DCM. It is early and Andrea Guardini is getting close in Malaysia for Astana, Garmin-Sharp have seen Farrar finish twice and have plenty more options whilst Vacansoleil-DCM will win somewhere soon either in a sprint or from a trademark breakaway. Things might be more complicated for the Spanish squad, they’ve been the last to win in 2010 and 2011. They’re hired some more sprinters and fast finishers like Jure Kocjan but the Basque team seem solar-powered and will perform once spring arrives. Outside the World Tour Europcar have five wins whilst Vini Fantini and Sojasun have three each with Cofidis on two, and each team will enjoy this as it brings more chance of wildcards. It almost goes without saying that the win count now is premature… but sometimes on the internet you have to spell these things out. Teams without a win should be patient but that said those with a high score will already feel satisfied and looking forward to the upcoming races. 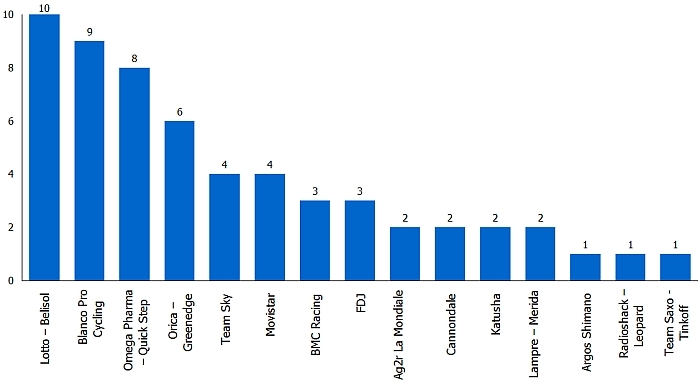 Plus these wins are a helpful marketing tool for the likes of Blanco and Orica-Greenedge who continue their hunt for sponsors. There’s quantity vs quality to remember too. A win in Paris-Nice or Milan-Sanremo next month is worth more than any rankings on the chart above for many but the World Tour’s promotion and relegation system doesn’t reflect this as it rewards consistency ahead of trophy collection. We’ve only had one race on the World Tour calendar, the Tour Down Under. Paris-Nice is the next event. But if this sounds light, note we’ve had over 80 days of racing this year or put another way 15% of the total race days for 2013. Surprisingly by the end of the March a quarter of the year’s race days will be completed so whilst we might look forward to the Monuments of April, the grand tours and other big races in the summer and autumn, getting wins and points in March is crucial to a team’s win count and ranking. I was going to say the victory count doesn’t matter but if we’ve had 15% of the races then it matters. Will be interesting to review this at the end of March. Yes, I’ll aim to revisit this towards the end of March. What happen to pistol win this yr in south america does that count? If you mean Contador’s win in the Tour de San Luis, yes this counts… but the image above chopped off Saxo so I’ve redone it to include their win. Interesting stats to stress the importance of early season wins. E.g. OQPS previous season: started a win serie in January that lasted throughout the whole spring. Besides that: quite remarkable to find Blanco Pro Cycling at the top. the teams that have impressed me this season are FDJ & Ag2r,they have always seemed to be in the picture and there at the finish unlike last season when very rarely did you see their colours. I’ve been impressed with Blanco! It is remarkable how they bounce back. And Bauke Mollema has had a few top 5 places too I think. I bet they are motivated to win, and if you look at for example their sprint train they are all working together as a team. Let’s hope they can keep it up. I follow the “about taking part” line of thought. I did a turbo session yesterday whilst watching last years last 40 ks of E3, good win for Tom and OPQS, but I came away with a memory of Ian Stannard riding on the front of the bunch for SKY albeit to no avail. What a difference for Blanco! I wonder if Rabo feel stupid now they left the team and paid all the money but get no good publicity? They’d been in the sport for a long time but yes, it says something that they prefer to leave the money but not get any more publicity from the team. Maybe the team’s uncertain future is shaking things up a bit? There was already a big shakeup before Rabobank quit, because everybody felt the team was seriously underperforming. Long criticized Erik Breukink and Adrie van Houwelingen were fired last september. Merijn Zeeman, the coach behind the successes of Degenkolb and Kittel, was bought from Argos-Shimano, Jeroen Blijlevens came over from Rabo’s women team (Marianne Vos, how much more successful can you get?) and Michiel Elijzen came over from Lotto. Furthermore, the team announced it would intensify its cooperation with several universities. So the riders may be extra motivated by the need to find a new sponsor, but some big structural chances already happened before Rabo quit. There seems to be a new spirit, a fresh wind, blowing through the team, which could probably be due to the management shake-up! Maybe they had become too soft, what with having the ‘firm’ support of Rabobank, and now that they have lost that comfort zone they have smelled the salts and are wide awake! It is good to see them shining, though! Also good to see Mark Renshaw get a win today, even if it was not up against top sprinters it will still serve as a confidence booster, and indicates that they are really showing team-spirit! Then again, they do have a spiffing new aero bike to jump on! But hard to know where the sports science and support ends and where the basic need to get a job, a contract and make money takes over? I saw Blanco’s Graeme Brown at Tour Down Under, looking leaner than I have ever seen him in past decade. Maybe didn’t win, but certainly looked hungry! I have even dared a hypothesis that lack of sponsor gives you an extra motivation. In the past we had similar situation with Highroad team – very successful, and last year Greenedge enjoyed decent spring only to welcome Orica before Giro. Rabobank will still get plenty of publicity this year when Paul and Phil insist on mentioning them every time Team Blanco feature in the Tour. Advertising by stealth. Interesting to see, thank you. While it’s still early season it would also be interesting to correlate the number of wins with each team’s budget, or some other factors like youth or experience (the comment above about staff’s expertise / success could fit in here). But I imagine you’ve done that before? I have a weird feeling that Rabobank may reverse their ruling and stay as a sponsor after making this one-year stand against the sport. I’ve had these “weird feelings” before and have never turned out to become a reality, so I’m not betting the farm. You shouldn’t either.